← Tipping Point 4 Is Released! New game for Facebook: Do You Know Your Friends? 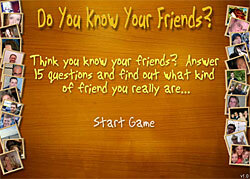 I’ve just released my first Facebook experiment: a game called Do You Know Your Friends? The game took about 6 days to complete (after spending a couple days trying to understand the Facebook API). It’s basically a quiz game written in Flash that asks you questions about your friends and gives you a ranking based on your score. Your ranking can be anything from Hermit to Super Friend.